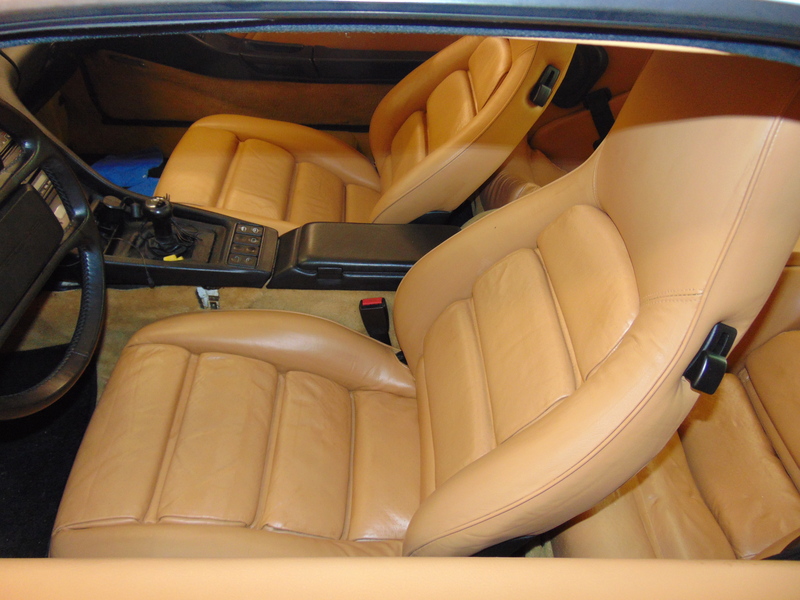 Last weekend I got a chance to install my newly re-dyed leather upholstery. A few preliminary jobs were required. 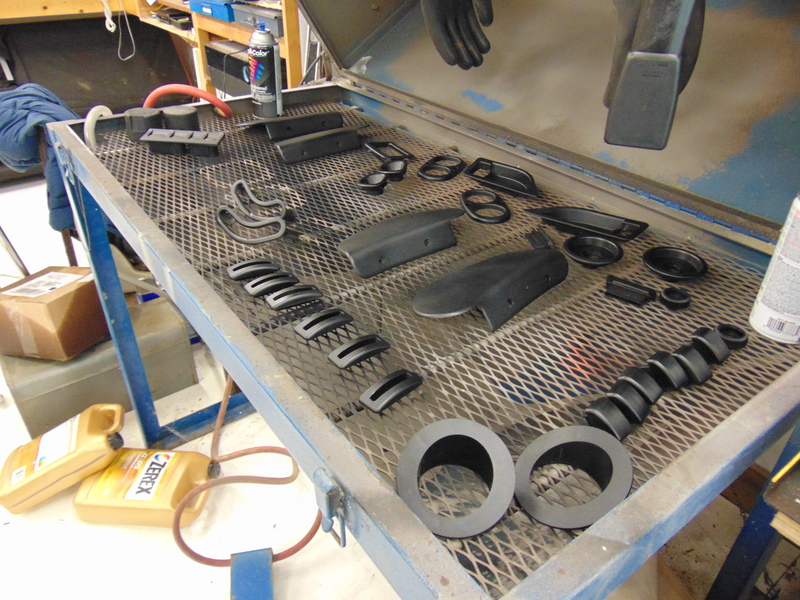 First I decided to paint all the loose plastic parts with a black satin spray can paint. While this paint was drying (actually well after it was dry) I spent quite a bit of time cleaning out the small round holes in the seat bottoms and backs that had filled with paint. I used a safety pen which was about the right size and developed a temporary handle to allow me to hold it steady. So many holes! Not all were filled but enough were to make this a time consuming job. I also added a little more padding to the rear most bottom segment of the drivers seat, to fill it out. I added the plastic bits back to the seats and they were ready to go. I put one on the scale. 54 pounds! No wonder my veins pop out when I pick one of these seats up. The seats are made by Recaro and are 4 way adjustable with electric motors. Here is a shot of the mechanism on the underside. It is a clever arrangement. 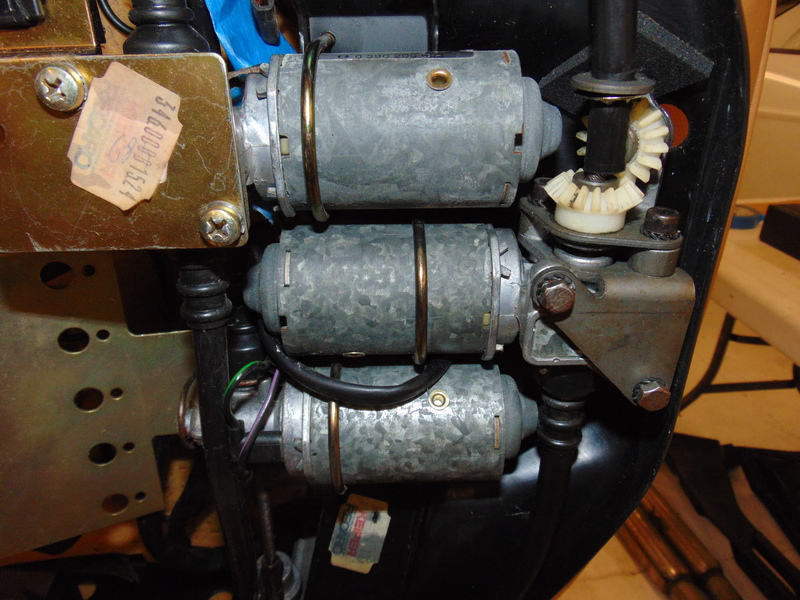 The closeup shows the 3 drive motors. Each motor drives flexible shafts. 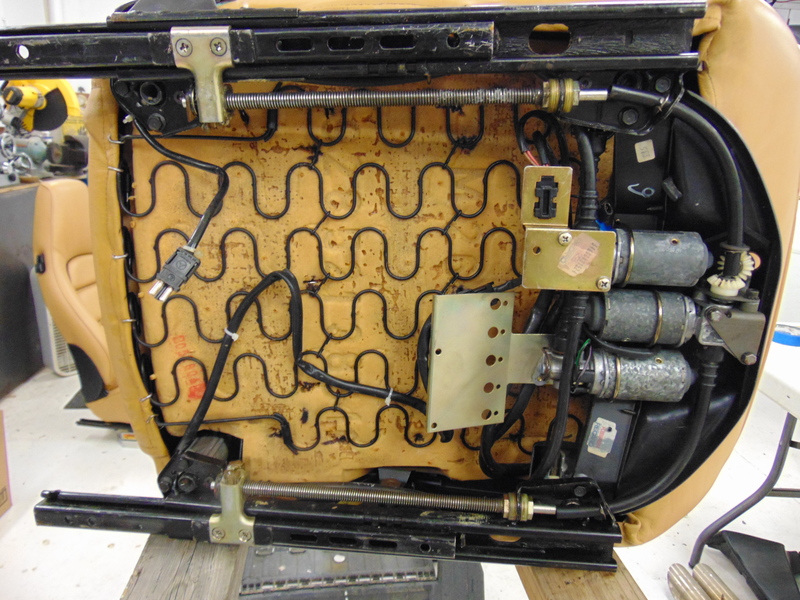 The middle motor turns the threaded rod that moves the seat forward and backward. At the 4 corners there are short threaded shafts that are oriented vertically. Rotating all 4 the same direction raises the seat. Rotating the front 2 in the opposite direction of the rear 2 tips the seat bottom. Again, very clever. First I installed the rear quarter panels. Oh, I bought a fastener kit from Bob Budd. This includes a selection of the plastic clips that tend to break off, as well as the various black screws and cup washers. 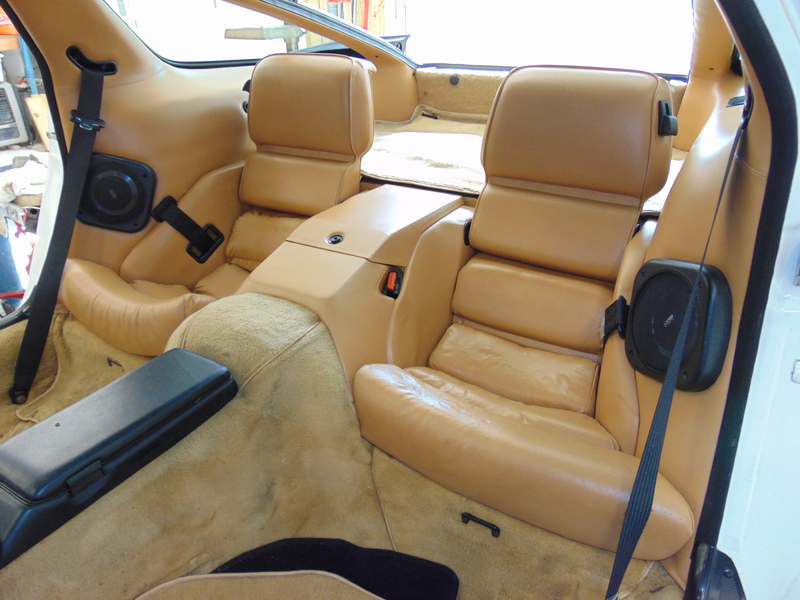 After the rear quarter panels came the rear center console and the rear seats. Next I installed the seats. 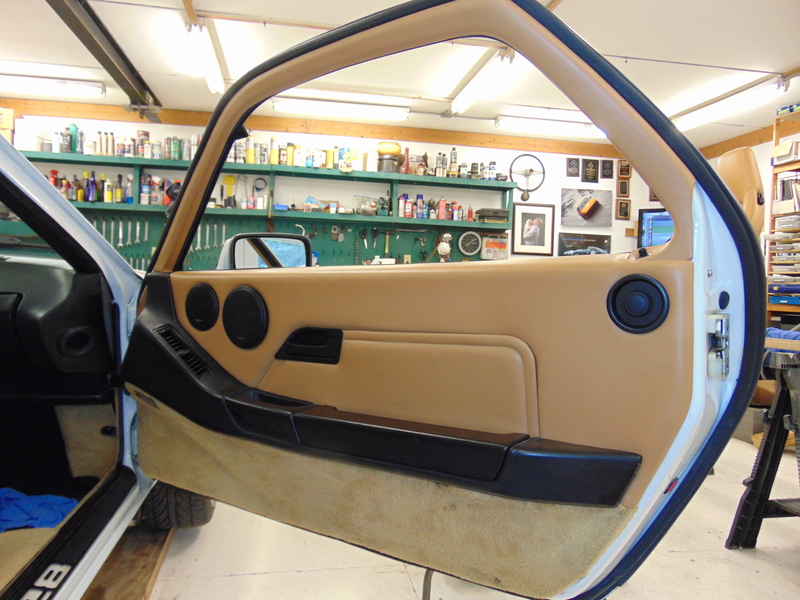 Then the door panels. As I mentioned in my previous article, I changed the color from Champagne to Cashmere Beige. As you can see, the true color can vary depending on the lighting. I’ll try and get some shots in sunlight. 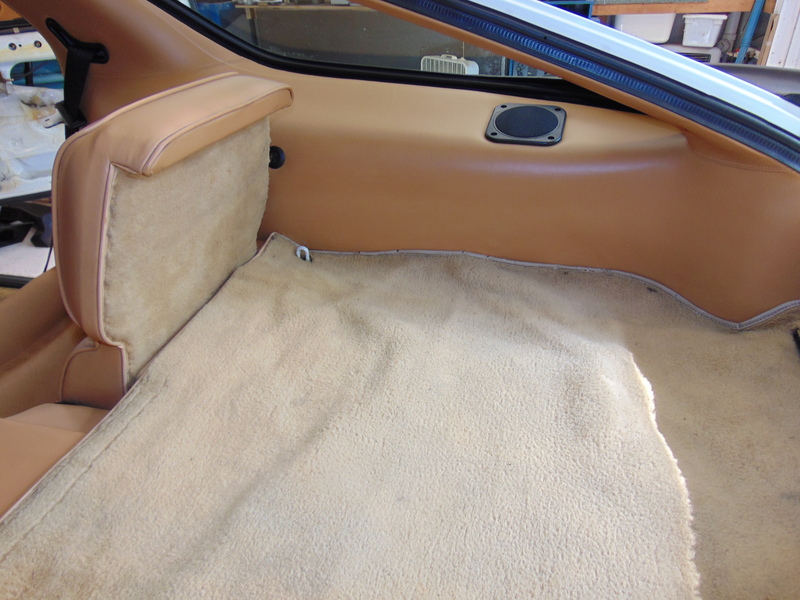 Now that I have the seats installed the carpet does look very tatty by comparison. I don’t think it can be salvaged efficiently. I have contacted Bob Budd at Classic Nine Leather Shop to fabricate a new set using the correct Cashmere Beige color. I am excited about the new carpet as the interior should look fantastic once everything is installed! Stay tuned.